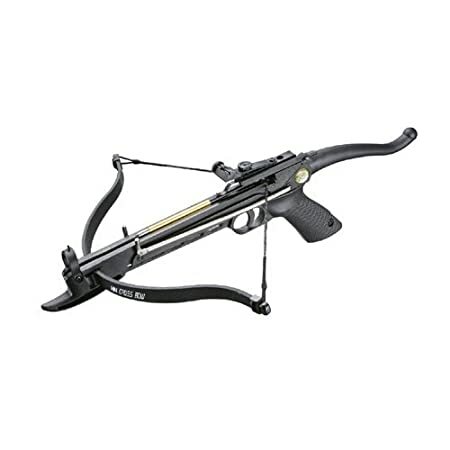 Are you searching for a pistol crossbow to add to your collection? Or maybe you’re interested in investing in your first one just to try it out. If so, this article will help you. Pistol crossbows are a great tool to have whether you want to practice hitting targets or actually get out and trying to hunt small game. Below are some things to look for when shopping for a pistol crossbow and some of the top products you can invest in. What is a Pistol Crossbow? 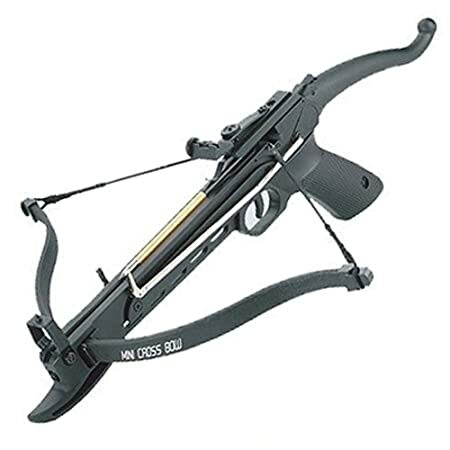 A crossbow pistol is basically a safer and more lightweight version of a regular crossbow. It’s designed mainly for small game hunting or for target practice. While they don’t have the same power and abilities as a regular crossbow, they are much more affordable and easier to use. This makes pistol crossbows perfect for those who want to just practice their aim or see if a crossbow would fit their needs. When out shopping for the best pistol crossbow, there are a few things you need to keep in mind. Below are a few key areas to look at before you buy one. A draw weight is the amount of weight you’ll have when you pull back the pistol crossbow’s bow. The more you pull it, the more weight you’ll get. If you want a powerful draw weight, which can help to make the arrows fly faster, you’ll want to look for a high draw weight number. You’ll find everything from draw weights from 50 lbs. to 200 lbs., so it’s important to consider the amount you need. Another thing to look for when searching for a pistol crossbow is if it comes with extra goodies. Many models will usually include strings, end caps, and arrows so you’ll be well-equipped when you use it. However, not every product does, so pay close attention to the model you’re interested in to make sure it comes with these things if you need them. A self-cocking pistol crossbow will help to draw the product’s bow in certain directions without you having to exert much force to do so. This feature can make it very easy to use a pistol crossbow which is why it’s a good idea to look to see if a model includes it. When you shop for these products you’ll come across some models that are already assembled and others which need to be before you can use them. If you’re just starting out with using these devices, it might be a good idea to buy a pre-assembled one. This way, you wouldn’t have to worry about whether or not you properly put it together and you can instantly start using it when you get it. If you do happen to buy one that needs to be assembled beforehand, make sure it comes with easy-to-read directions. Otherwise, it might be very time-consuming and confusing to do. A scope will help you to better see your target when you’re about to shoot an arrow. Many models often have a scope or sight built into the top of it. So, if you want to help keep your aim on target, definitely make sure the pistol crossbow has a scope built into it. While pistol crossbows cost significantly less than a regular crossbow, they do come in various price ranges. You’ll want to look at the price depending on your skill level. Less expensive ones aren’t necessarily as powerful and come with as many features as expensive ones, but they are usually a good type to practice with. If you’re a more experienced user, an expensive model be worth investing in thanks to it usually having better precision and features. The Prophecy Pistol Crossbow is an affordable model made with a sleek black aluminum body. This will help to ensure that it stays durable and can withstand heavy-duty usage. It has a draw weight of 80 lbs., so it’s somewhat lightweight compared to some other similar models. This self-cocking crossbow can travel far. It has an FPS of 165 and a power stroke of 6-4/5 inches. This model comes with a string and end caps so you don’t need to worry about investing in them with a separate purchase. Keep in mind though that this model can sometimes be a bit difficult to string, so you’ll need to be prepared to set aside some time to do so. 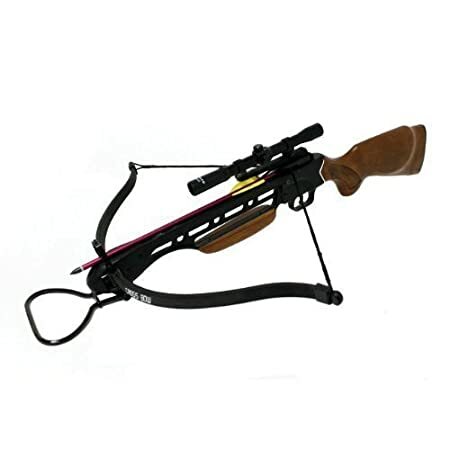 This pistol crossbow model by Wizard Archery Hunting is ideal for those who want to hunt big game. It has a draw weight of 150 lbs. and has an FPS of 210. It’s made with an aluminum casing so it will be able to withstand a lot of wear and tear. This model also comes with a scope which measures 4 x 20 inches and will help you to better see where you shoot the arrows. 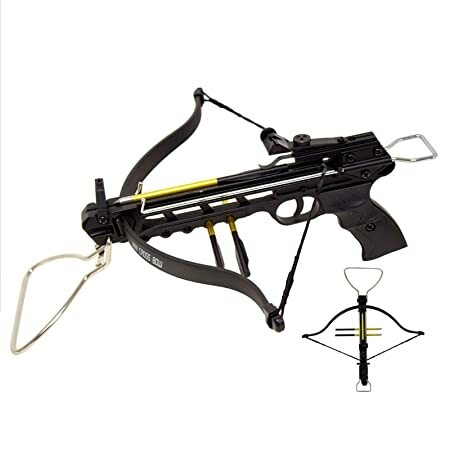 This short stock crossbow comes with eight arrows and a rope cocking device. This crossbow is a little on the pricey side, so unless you’re extremely experienced in using one of these devices, you might want to try a less pricey model first instead. 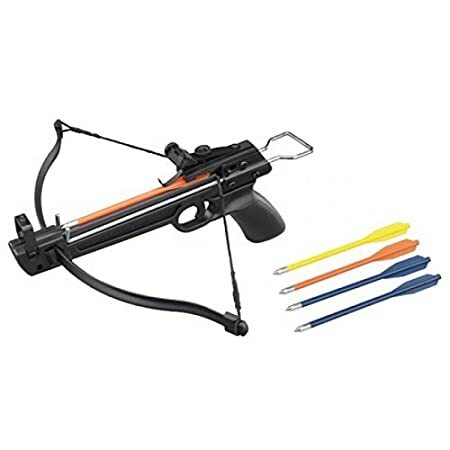 The Ace Martial Arts Supply Pistol Tactical Crossbow is made with a plastic casing and a fiberglass bow to help make doing things like target practice easier. This affordable model has a sight built into it and comes with three arrows. These arrows have a 165 FPS and work powerfully even though this crossbow only has a draw weight of 80 lbs. It has a self-cocking system to help make things quicker so you don’t have to wait to reload. However, this model isn’t the most durable due to its plastic casing so you’ll have to be careful when using it. 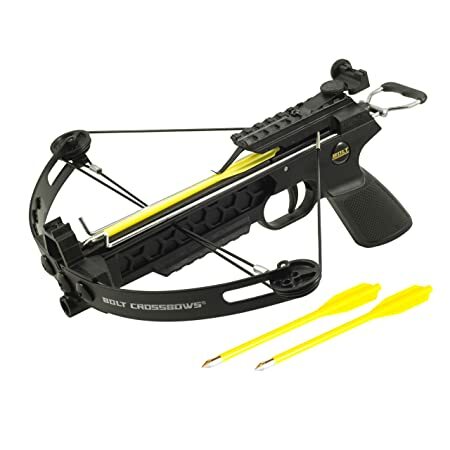 This small crossbow model by Tactical Crusader is a good model for those who just want to do small target practices or see if a pistol grip crossbow will work well for them. This very affordable model comes with four sharp and colorful arrows and a target you can use to practice on. It has a draw weight of 50 lbs. and is very lightweight so it won’t be difficult to move around. This model isn’t the most durable though and sometimes the stringing can be a bit time-consuming. It’s very powerful though for its size which makes it ideal for beginners to consider investing in. The Last Punch Cobra Crossbow is made with a black design over a strong aluminum housing. This housing is protected by a layer of plastic so this crossbow stays durable. The crossbow has a draw weight of 80 lbs. and an FPS of 160. It also has a self-cocking system to help make things easier when you use it. 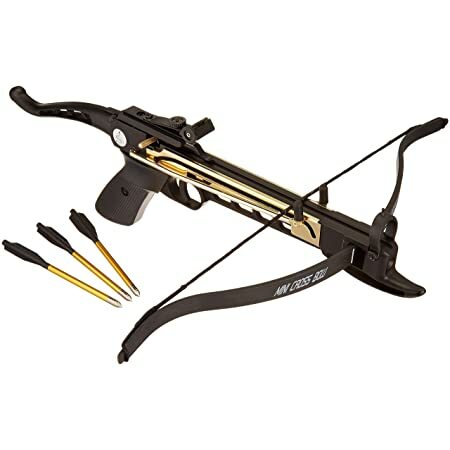 The model comes with metal arrows which have a power stroke of 6.8 inches when shot out of the crossbow. This powerful model is easy to use and comes at an affordable price so you won’t break the bank investing in it. 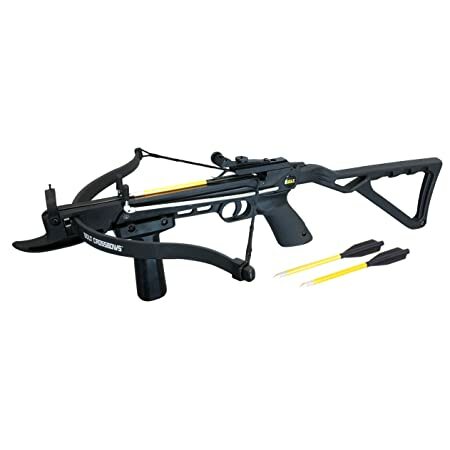 This crossbow by SAS is made with a durable housing that’s coated in a sleek black color. It has a draw weight of 80 lbs. but it’s very lightweight to carry around so you can easily transport it to where you need to be. This pistol crossbow has 27 bolts and a self-cocking system so you can easily use it. It also has an adjustable sight built into the top of it so you can better see your target. The arrows, when shot, have an FPS of 160. This model comes with extra string, arrows, and end caps. It does need to be assembled though before you’re able to use it. The Manticore Crossbow is a pricey model, but it’s a powerful and well-built one. 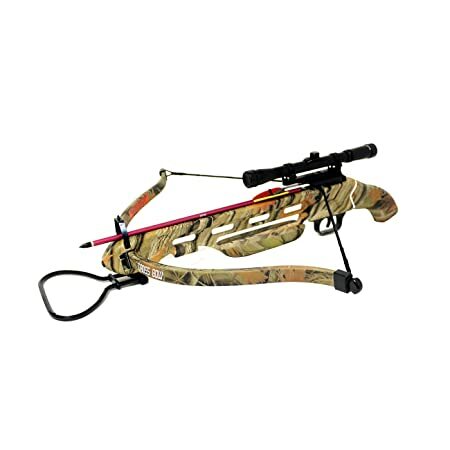 Featuring a draw weight of 150 lbs., this crossbow features a durable wooden frame and an aluminum scope on the top of it to help make seeing your target easier. It has a fiberglass limb to help make shooting the arrows effortless and also has a self-cocking feature so it can make stringing the crossbow a cinch. The Manticore Crossbow comes with strong arrows you can use for your practices or hunting adventures. Keep in mind that while it does have a self-cocking feature, stringing this pistol crossbow can be a little tedious. The Seeker, an incredible pistol crossbow by BOLT Crossbows, has a draw weight of 80 lbs. and an FPS of 200. It features a grip on the front of it to help you better balance and hold onto the crossbow when you use it. While small, this model is quite strong making it perfect for target practice or hunting small game. This crossbow comes with a lever cocking feature and adjustable sights on the top so you can better see where you’re aiming the arrows. It comes with arrows, a target, and instructions on how to assemble and use it. The Pitbull is a good pistol crossbow model for those who just want to get some practicing in. It has a draw weight of 28 lbs. and an FPS of 150. It’s made out of a durable metal frame so there’s no need to fear about it being damaged easily. This crossbow has 3 bolts built into it which help to better support the device and the arrows you plan to shoot with it. This model has rails on it you can use to attach flashlights and other similar devices on and comes with arrows and easy-to-read instructions. The Pitbull has a one year warranty. This crossbow pistol for sale is made with a sturdy aluminum frame and has a draw weight of 80 lbs. It has an FPS of 160 so arrows will fly out of it quickly. This crossbow also has a safety feature built into it when you draw back the bow to help ensure you don’t accidentally hurt yourself when doing so. 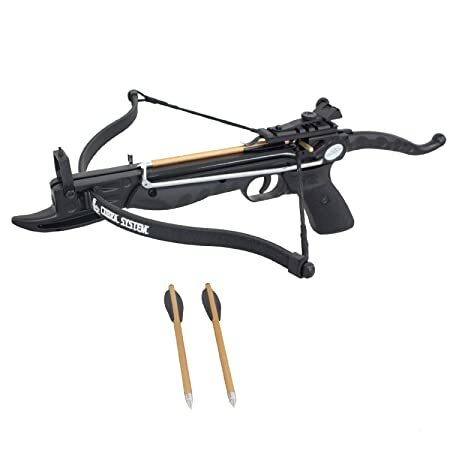 The Rogue Pistol Crossbow comes with a target (located on the back of the box it’s packaged in), extra string, end caps, and three arrows. Keep in mind stringing this model might be a bit difficult. Otherwise, than that, it’s a pretty powerful model that’s ideal for small target practices. A pistol crossbow is a perfect device to use if you want to practice target shooting or small game hunting. They come in various styles so everyone, regardless of their skill level, can find something that works for them. If you’re on the search for the best crossbow pistol, definitely keep the models mentioned above in mind. They are some of the top ones on the market today and come with some impressive features.